2 Ready to Make Your Own? Well, summer has finally come to Colorado! It’s time for walks to the park and days by the neighborhood pool…which means lots of sun protection is needed. If you’ve ever been to the Rocky Mountains, you know that the sun shines brightly here almost every day of the year and it can be rough on little eyes. My grandson, Hudson, is particularly sensitive to light and we’ve had to be really careful about protecting his eyes, but at 6 months old, sunglasses are just not his thing. So, Grandma did what grandmas do and she (I) made him a hat. I had searched the internet for the perfect little bucket hat that would shade his eyes but still allow him to see what was going on in the world. After not finding just what I was looking for, I grabbed my hook and raided my yarn stash to make him the perfect little sun hat. He loves it he just looks adorable when he wears it to the pool or the park. This one is perfect for the Fourth of July! or, for the most convenient option, get the ad-free, downloadable pattern in all three sizes for less than the price of a cup of coffee by clicking this link to Etsy or Ravelry. This hat is worked in rounds from the top down. The initial CH2 at the beginning of each row is included in the stitch counts. For a smoother seam, replace the CH2 at the begging of each row with a CH1, DC or a CH1, HDC. For no seam, work in the round using a stitch marker to mark the beginning of each row. Rnds 7: repeat round 6. Rnd 10: repeat round 8. Rnds 7 – 8: repeat round 6. Rnd 11: repeat round 9. 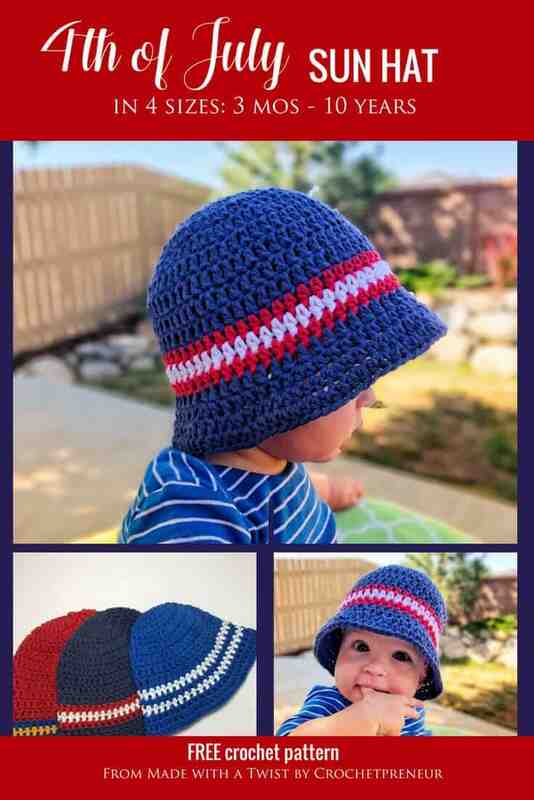 Free Pattern is for Size 1 – 3 Years Only. For the Premium PDF Pattern with all Four Sizes, Please See The Links to Ravelry and Etsy, Above. Rnds 7 – 9: repeat round 6. Rnds 7 – 10: repeat round 6. What a resourceful Grandma and the hat is so cute. Perfect for those warm sunny days. In the 6-12 month size round 5 I don’t get 56 stitches. Are you sure the count I correct? Hi! Yes, the stitch count is correct. You’ll be starting with 50 stitches. Then, as you work the row, you’ll be increasing by one stitch in the first stitch and then, working the pattern repeats, you’ll be increasing by 5 more stitches (once as you work from * to * and then 4 more times as you repeat that section), for a total of a 6 stitch increase for 56 stitches. Please let me know if you continue to have trouble and I’ll see what I can do to help!